September 13th 2016, I leave Maghera with the intention of heading to the Co. Antrim coast do a little drone filming, it was such a beautiful day, calm, sunny, very warm, perfect for flying. I leave the junction in Maghera and make my turn onto the Coleraine Road, once I clear the tall trees I look to the NW and immediately get a shock. There was a massive fire raging somewhere in the distance, I couldn't tell where it was but it was clear even from this range that it was major, the smoke was filling the sky with the breeze blowing the smoke across the Sperrins, I immediately changed my plan and made a bee line in that direction. I continued N then once in Garvagh it was clear the fire was even worse and of considerable size and was to the W of me, so I turned at the traffic lights in town and ascended uphill onto high ground, using my sat nav and naked eye dead reckoning I managed to find the fire after 15 min's of driving through the countryside and found a road which literally offered a perfect side-on view to the event. 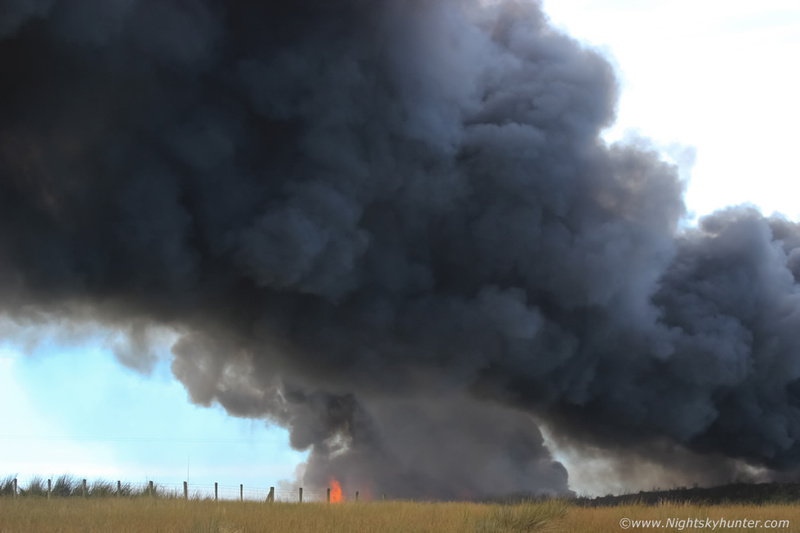 I was perhaps 500m from the source but because of the lay out of the sweeping fields I couldn't tell what was actually on fire, for a moment I considered the possibility that one of the local wind turbines was ablaze. I could see fire trucks in the distance attending the scene and cars of onlookers were stopping to watch what was becoming a very dramatic and potentially dangerous event. I pulled tightly into the side of the road near a gate so I wasn't blocking this country road for emergency vehicles. I thought to myself 'this was what drones were made for', I would be able to see more from the air and perhaps get an idea of the bigger picture which might help with fire service or police. I grabbed my case and climbed over the gate into a large field and walked away from the road and quickly prepared my drone for flight. I did my pre-flight checks, battery levels of RC and drone, signal strength, made sure I had full GPS lock after calibration, did a visual check of the area for any hazards, I was far from any people or cars, the only thing of note was a cable running across the poles at the end of the field, I would just have to fly over that, other than that the area was perfect, great line of sight, nowhere near a congested area, far from any no fly zones etc, I also did one last check to make sure the frame was good and props behaving, I hovered for a few min's then flew with intent above the cable and over the fields towards the fire, I had done countless hours of flying every day previous to this event so this flight was like a walk in the park, muscle memory simply took over. It was clear that this wasn't a wild fire or a wind turbine, I could see man made objects with smoke and flames erupting from them like a volcanco. I moved closer to inspect the source, it was obvious that numerous cars were on fire, I would later learn it was Higgin's Car dismantlers. 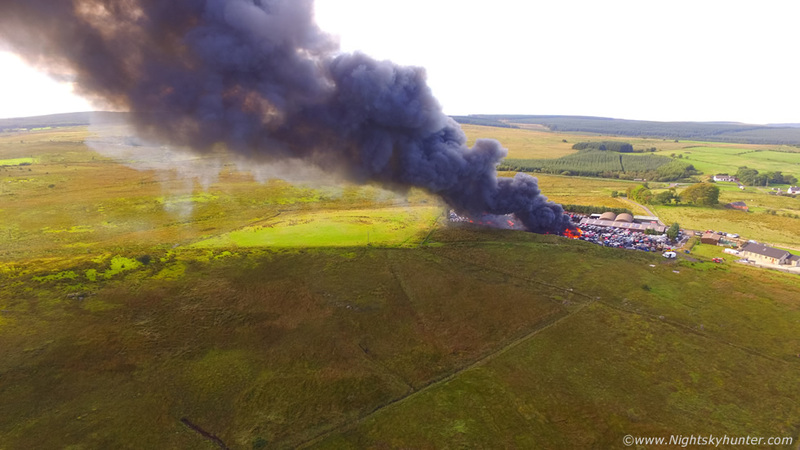 I could see the fire service busy with hoses battling the fire and from my bird's eye view point I saw more fire trucks, water tankers and police arriving on the scene. According to CAA regulations I'm not allowed to fly any closer to a person or vessel not under the control of the pilot, so as tempting as it was to hover down low in the thick of the action for the most dramatic scenes I decided to play it safe and respect the regulations, this was as low as I got, the telemetry on my screen informed me I was 80m high so I was more than good. I just hoped nobody had been hurt, it was impossible to tell but there was a lot going on down there. 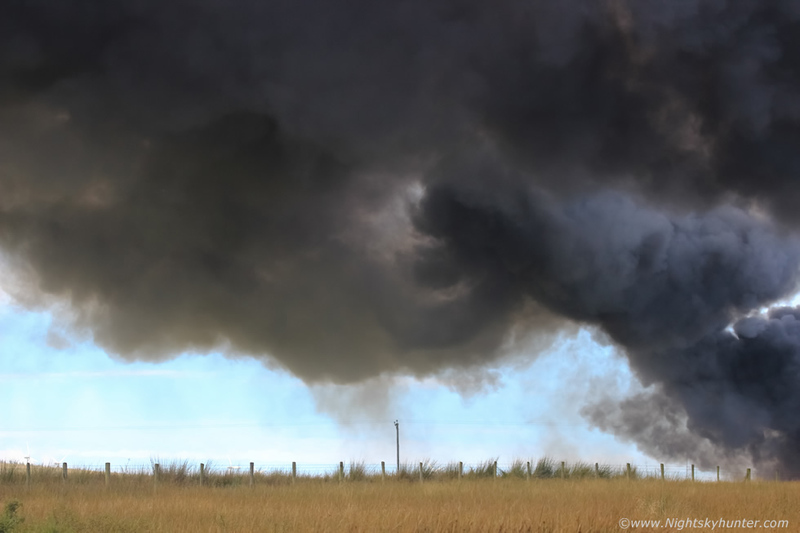 I concentrated on filming the gigantic smoke plume issuing from the yard and panned to watch it rush across the sky downwind for miles across the countryside, the view was absolutely breathtaking. I ended up doing two flights, doing as much filming of the structure as possible including several stills then landed by hand catching the Phantom in the field just as two PSNI officers watched on. I packed away the drone, took out my DSLR with 100-400mm lens and began taking ground based stills to document what it was like at human eye level. The telephoto lens allowed me to zoom into the action while maintaining a safe distance. It was actually very intimidating as this fire raged, I've documented many gorse fires before in the past but there was something about this one which unnerved me, I think it was the incredible speed of the smoke, those massive black plumes seemed to expand rapidly per second like convection or a flanking line in a fast time lapse, it felt like this fire could cover ground quickly and that I could be at risk so I kept doing visual checks around my location to make sure a new fire hadn't developed nearby and was about to engulf me, I was positioned to the side of down wind direction so I knew I had to be relatively safe, even so I mentally plotted an escape route. What made things worse was the incredible sound, not only could flames be heard at that range but I could also hear loud bangs and cracks which sounded like tires popping and oil and fuel exploding, I felt like ducking a couple of times for it sounded like gun fire, I'm not exaggerating one bit, you can hear some of those cracks on the video below, however it was a different experience hearing it live. Two sources of fire and monster smoke plumes blowing R to L at high speed, and I mean high speed. 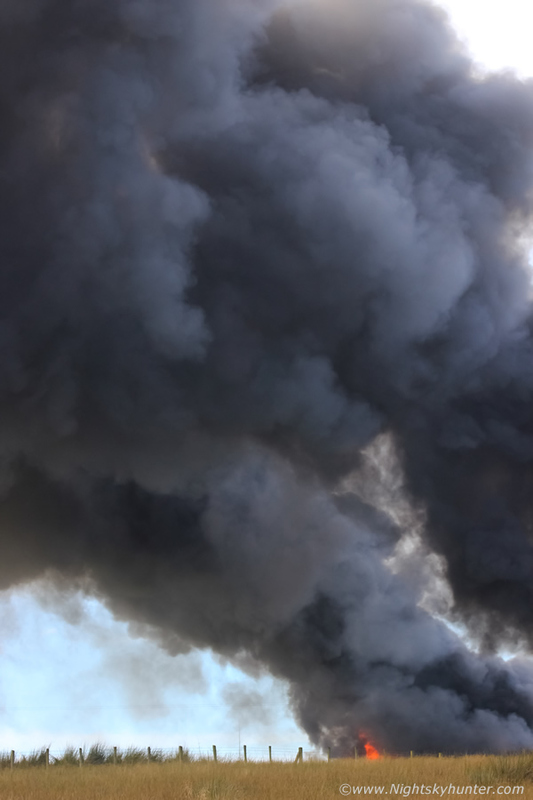 I was shooting into bright hazy sunshine which made exposing the scene rather difficult, I decided to sacrifice the highlights and concentrate on accurately documenting the terrifying black smoke plume. It was difficult to see my LCD screen under the bright sun. 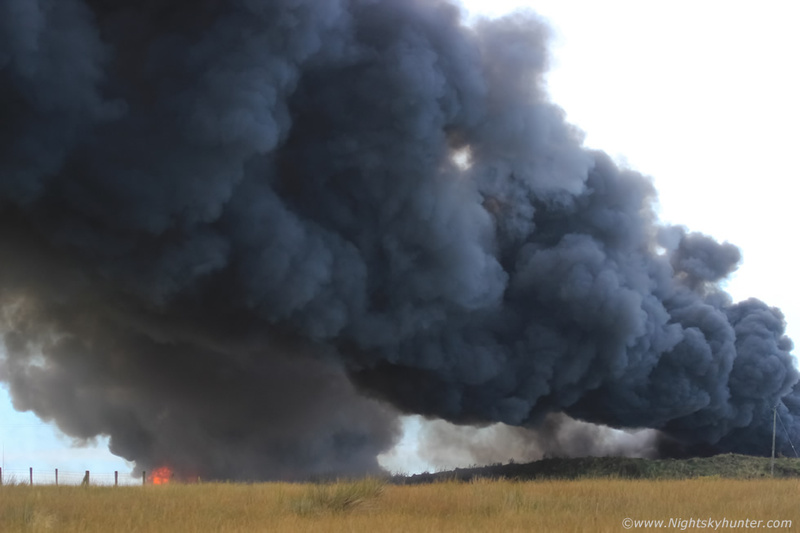 These big fires always remind me of wedge tornadoes on the ground, having said that I did see many examples of rapid lifting and rotation similar to a fast rotating wall cloud from the rapid rising air, the visual comparison to convection was very striking. Several people who lived in the homes beside the fire came over asking if I was the one flying the drone, I admitted I was, they wanted me to email them incase they needed the footage as evidence. Two of their homes were close to the fire, the fire service had asked them to leave so you could imagine what was going through their minds, these poor people worried there homes were going to be burnt down. 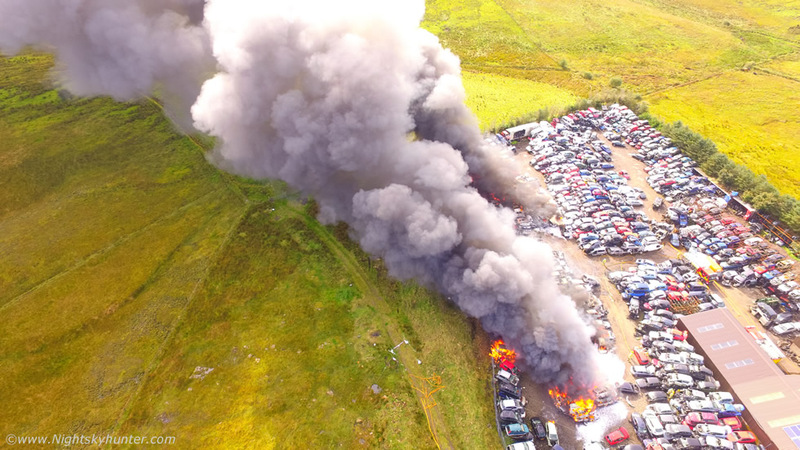 You can see the houses on the drone footage to the R of the cars, thankfully the wind was blowing a different direction and their homes were spared, had the wind been blowing from the W or SW then it could have been a different story indeed, thank goodness it worked out for the best. 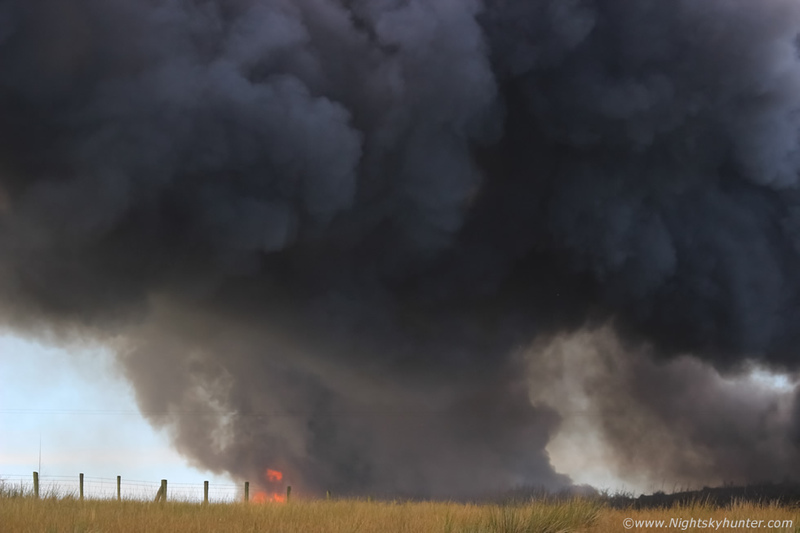 I watched the fire for half an hour taking many images and captured it at its most dramatic moment then the combined forces of several fire departments got the better of it and soon the black smoke turned to grey and the billowing clouds eased and it was now under control. As far as I'm aware no one got hurt however the event came at a great cost to Higgin's Car Dismantlers. 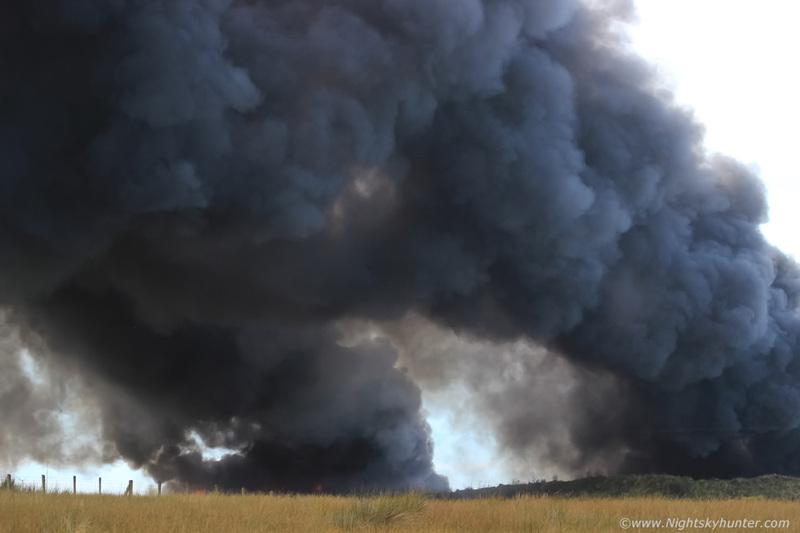 Newspaper reports which followed stated that 600 cars were destroyed in the blaze, furthermore it was being treated as an arson attack. That is terrible news, my heart went out to Higgins for their damage and set back, but on the positive side nobody died and I'm sure Higgins will get back on their feet in no time. Full video footage of the event, beginning with ground based DSLR video then transitioning to drone footage which looks extremely dramatic. When I left the house this day I never expected to encounter anything like this, it just goes to show you never know what you might see once you hit the road. I got to the coast the same day and spent the rest of the evening walking on the beach under blue skies and warm sun. Thanks very much for reading.